While putting together our SHOT report from a few weeks ago, we happened upon a Facebook announcement from Robin Christian of Dreamscape Cinema in Champaign that BAD COMPANY, his company’s bioterrorism action film that was originally produced in Piatt County in July and August of 2013, would street on the same day as the vintage student adventure – Tuesday, August 28. 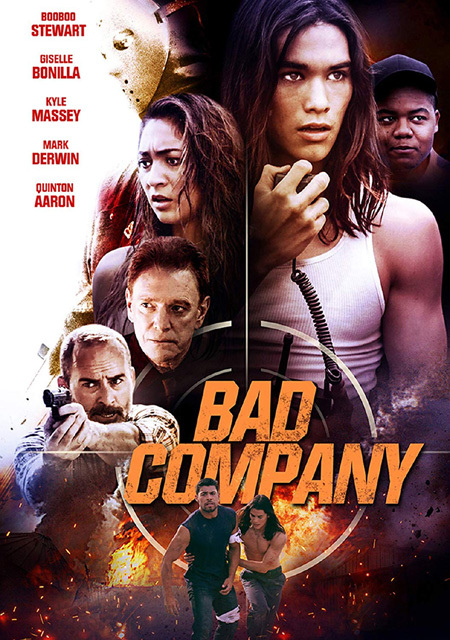 This included placement in Family Video locations across North America and additional exposure in Redbox kiosks nationwide thanks to the connections of MTI Home Video, the long-running genre label that picked up the rights to BAD COMPANY from sales agent Artist View Entertainment. Other than securing international distribution for the project, previously called LOWLIFES, this clears the deck for Dreamscape as all the studio’s completed features are now in commercial release with most available via Amazon streaming. You can access the older catalog – SHEEBA, DISCONNECT, ACT YOUR AGE, MY DOG THE SPACE TRAVELER, and the VOD-only DISPOSABLE – at this Amazon search result. Starring up-and-coming talents like Booboo Stewart (X-MEN: DAYS OF FUTURE PAST), Giselle Bonilla (FREEDOM WRITERS), Kyle Massey (THAT’S SO RAVEN), Madelyn Deutch (THE YEAR OF SPECTACULAR MEN), and Quinton Aaron (THE BLIND SIDE) as well as veteran actors like William Atherton (DIE HARD), Christopher Judge (STARGATE SG-1), Tzi Ma (THE MAN IN THE HIGH CASTLE), and Mark Derwin (THE SECRET LIFE OF THE AMERICAN TEENAGER), the film follows a group of teenagers that is enrolled in a disciplinary boot camp and becomes isolated when a rogue militia invades the immediate countryside. Troop members who survive an early search-and-destroy sweep by the invaders must put aside their pasts and band together in order to thwart a scheme to disable the nearby nuclear plant. Other than aiming to produce a yarn that is exciting and colorful, Christian took inspiration from the Lincoln’s Challenge Academy in Rantoul and their serious mission to help wayward youth turn around their lives so they may be productive or even heroic in the face of adversity. p.s. William Kephart, we hardly knew ye in this movie and it’s not because you went uncredited in your cameo. Snif. This entry was posted on Tuesday, September 18th, 2018 at 8:00 am	and is filed under Home Videos du C-U, Media Coverage, Production Updates, Videos du C-U. You can follow any responses to this entry through the RSS 2.0 feed. Both comments and pings are currently closed.